Black and white. SEAC Computing room at the National Bureau of Standards. This is a book page. Figure 1.1 SEAC from control console side. Figure 1.2 Component parts of a SEAC instruction . SEAC was the first computer to use all-diode logic. Diodes are much more reliable than vacuum tubes. 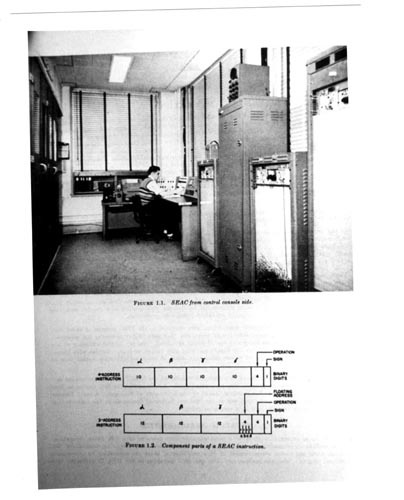 It was also the first stored program computer to be completed in the U.S. Standards Eastern Automatic Computer.